Communicate the benefits of INCOVER technologies to support market uptake. INCOVER technologies are being assessed from an environmental, economic and social perspective considering their entire life cycle from the conception phase (early-stage) to their end of life (EoL). This is accomplished by means of a tailored-to-technology Life Cycle Sustainability Assessment (LCSA) using Environmental Life Cycle Assessment (LCA), Life Cycle Costing (LCC), and Social Life Cycle Assessment (sLCA). Based on the results of the INCOVER LCSA calculations a Decision Support System (DSS) is to be developed to provide a tool for infrastructure planners. The LCA of the INCOVER processes has been implemented first and has made good progress. 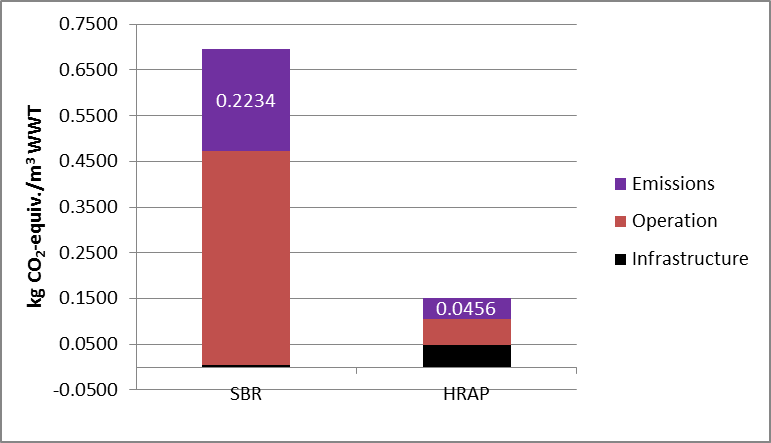 For example, the water treatment train of the algae-based technology in high rate algae ponds (HRAP) delivered valuable results showing that the HRAP technology performs significantly better than conventional sequencing batch reactor technology (SBR). The LCC calculations have been made parallel to LCA and data has been collected with the same data collection sheet as used for LCA. Data collection comprised capital expenditures and operation and maintenance costs including energy and staff costs as well. The Social Life Cycle Assessment (sLCA) framework developed for measuring social impacts of INCOVER processes has been based on a literature review of the available approaches and methods and on the study of the applicability of alternative sLCA procedures to different case studies. As a result, the UNEP/STEAC Guidelines was chosen as a suitable inventory of social impact categories to assess the INCOVER technologies. An inquiry among the project consortium using questionnaires helped in identifying the relevant social impact categories for the INCOVER technologies. The results were used to establish a common framework for social impact assessment according to the UNEP/SETAC Guidelines (Figure below). The impact inventory framework was developed on the basis of social aspects (or indicators) (e.g. local jobs created) which were linked to impact categories (e.g. employees). The entire sLCA framework defined for INCOVER project is shown on Table 1. Social and socio-economic mechanisms can take different forms, and so can the indicators. Because different social and socio-economic impacts might be best captured in different ways one can choose between quantitative, semi-quantitative and qualitative indicators depending of the goal of the study and the nature of the issue at stake. A quantitative indicator is a description of the issue assessed using numbers, for example, the number of accidents. Qualitative indicators describe an issue using words. They are nominative, for instance, text describing the measures taken by an enterprise to manage stress. Semi-quantitative indicators are categorizations of qualitative indicators into a yes/no form or a scale (scoring system), for example, presence of a stress management program (Yes/No). 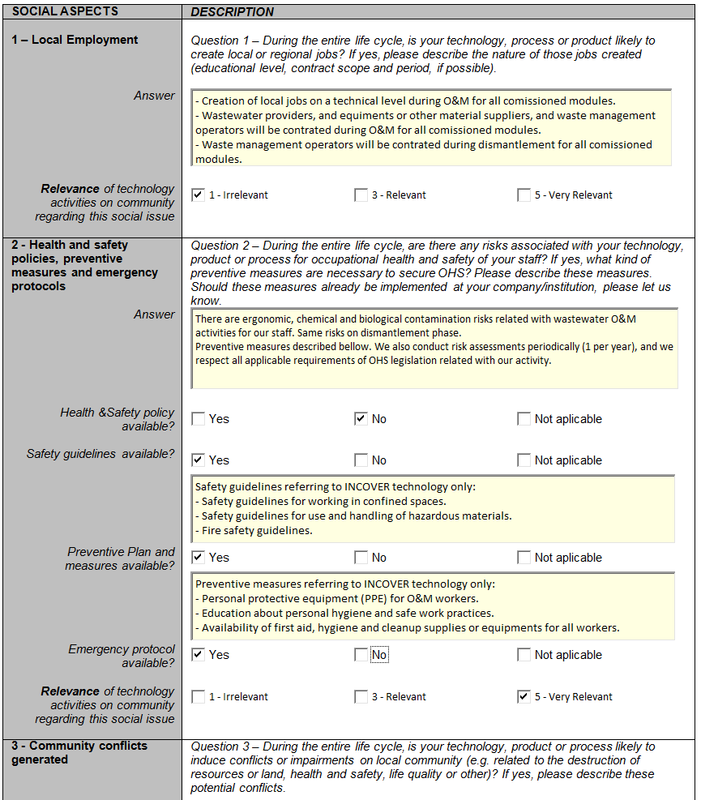 The data for INCOVER project is mainly semi-qualitative, using (Yes/No) answers depending on the existence of evidence or compliance of the social requirements referred on the inventory framework (Table 1). The data for calculating indicators is directly collected by a questionnaire from each INCOVER technologic partners individually and characterized with regional sector-specific reference data. This enables the calculation of relative social performances that are directly related to INCOVER products and the organizations affiliated with the production activities. An example of the used questionnaire can be seen on Figure 2. The questionnaire requires a scope definition of the stakeholder participation in the INCOVER project, in which the case-study, the work package, the modules commissioned and, the participated tasks are defined. Additionally, there are boxes to describe acceptance and suggestions related to the defined social aspects and indicators. 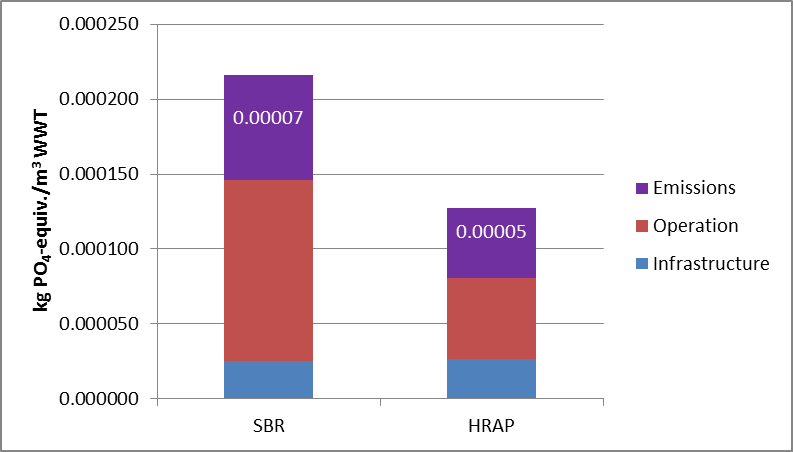 For every indicator the target or threshold compliance (%) are calculated and applied weightings are used to aggregate results on category (Category Social Index - CSI) and on overall index (Overall Social Index - OSI). Therefore, there are two weighting/aggregation steps. One that allows passing from inventory indicator results (inventory results) to a category result and another that allows passing from categories results to social overall impact result. In the questionnaire, it is also expected that each partner define the relative relevance of its activity or technology for the community regarding the social aspect or issue in question. At the end of the data collection phase these inputs will contribute to the definition of weights used to calculate CSI and OSI.